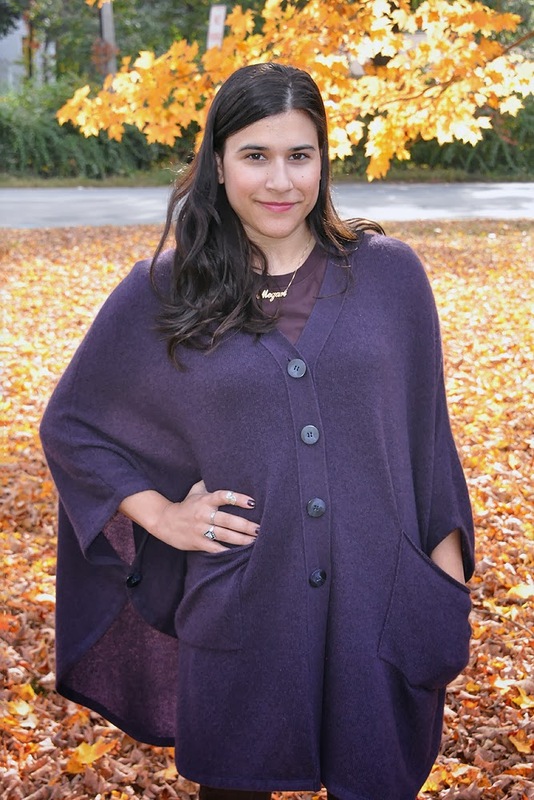 Capes, purple and cashmere. Put them together and you have one of my new favorite pieces! I scored this cashmere cape at Roundabout Resale on Saturday! I went in just planning to look around and spotted some purple in the clearance section, pulled it out and was greeted by this amazing cape! It was only $35, must be the fates telling me it had to be mine. I had been on the hunt for an affordable cape for a couple years and finally the fashion planets aligned to find my perfect match. I think I've found my new Fall weekend outfit. 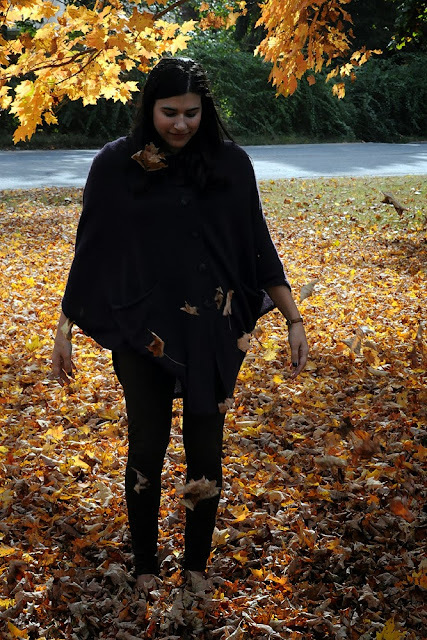 We also tried to take some spinning/leaf throwing pictures, but they didn't work out too well. * I received the necklace in exchange for this post, but my opinions are my own. I love the necklace but the cape is amazing!!!! You look super chic in it. Ohh the cape looks so cozy, and it really is just your style. What a fortuitous find! Look at all the beautiful fall leaves! It doesn't look like that here yet!! I love that necklace, it's way too cute! You/the pictures look like absolute fall perfection! Loving that cape - what a great find! wow is really Autumn over there... all the leaves have fallen!! Lovely cardigan and even lovelier necklace with your name!! Your necklace and shoes are beautiful. This is perfect for these colder days. i love the cape, you def got a deal! ADORE! First of all the pictures are fall perfection, I mean each leaf is a perfect prop for the post! Second I die for your name necklace, I so need one, and well everything in your look is so cute! 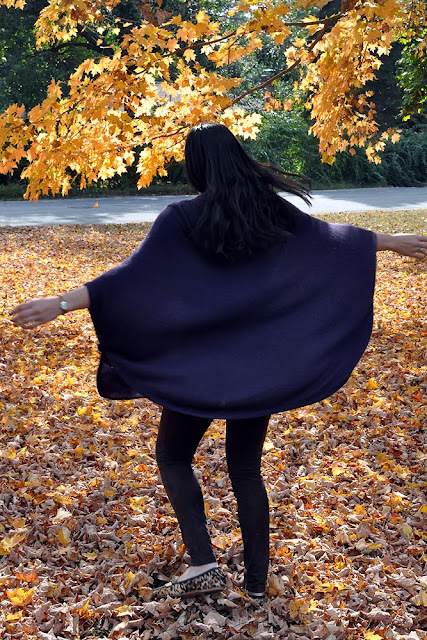 I can see why you couldn't resist this cape, and it looks especially lovely against the autumn leafy background. 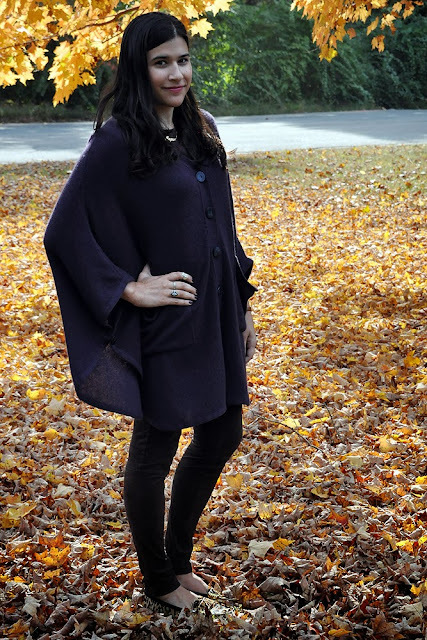 I have a ridiculous number of vintage capes as I adore the versatility of ways to wear them. love that necklace! Such a cute piece! The cape is stunning on you. 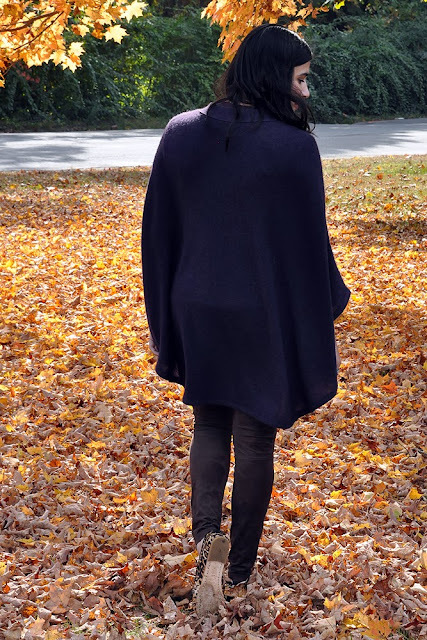 I love capes, this one is perfect for Fall and looks great on you!